Oh how awesome and very sweet. Enjoy! So the sweet member doesn't want anyone to know who he is? Does his name start with a K? She is cute. I wish the best for her. 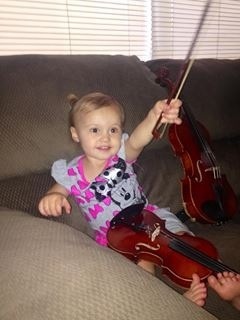 We have an 11-month granddaughter, and her mother is thinking about getting her a 1/32 violin. I introduced her to plucking the strings when she was 1 day old. A few months ago she drew the bow for the first time. A few weeks ago she found out how to change the notes by pressing the string. Oh she is adorable! That is awesome! Thanks everyone.... yep.. @Fiddlerman "K" is the magic connection. Very cute. We are just now setting up instruments for a school and doing something we don't normally do, working with some real small instruments. They are so cute and funny IMAO. With the hundreds of instruments I now handle and play every month, I can't get used to their tiny size and sound. Like little toys.